Spokane Broadcasting corporation applied for a construction permit on 13 June 1930 to move KFIO from the North Central High School to the Pedicord Hotel (aka Pedicord Apartments) because their lease with the Spokane School District was running out in July 1930. The FRC granted a construction permit on 18 July 1930 and KFIO began testing in August 1930. A license to cover the construction permit was issued on 5 December 1930. The FRC records state that the station employed a composite broadcast transmitter with direct crystal control and was rated at 100 watts. This transmitter was rebuilt in 1934 and was subsequently used at the Sherwood Building. The construction permit application describes the antenna as an "L" type with a 75 foot long horizontal portion and an 85-foot long vertical lead-in. The counterpoise was said to be an "L" shaped and 100 feet long. There were two towers of unknown height 110 feet apart between which the aerial was strung. 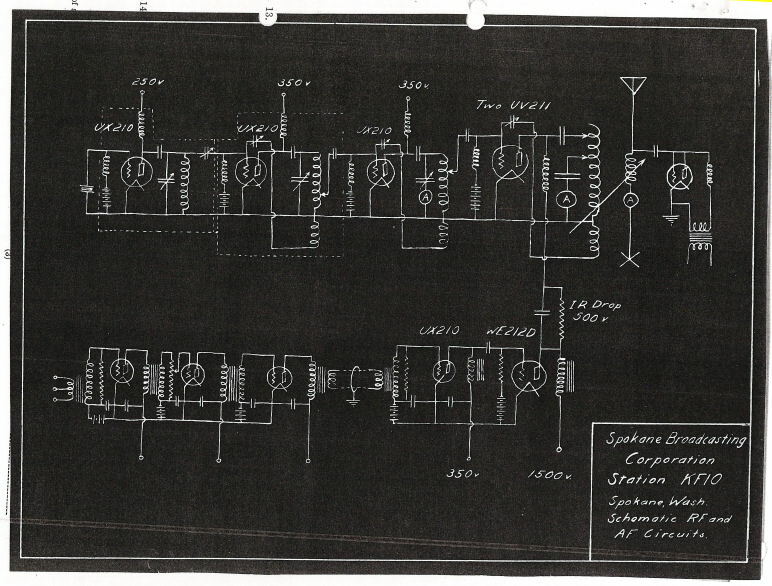 This system was used until May 1935 when KFIO moved its transmitter to the Sherwood Building. KFIO Radio Station Construction Permit 18 July 1930. Federal Radio Commission, Washington, DC, USA. From the National Archives, College Park, Maryland. 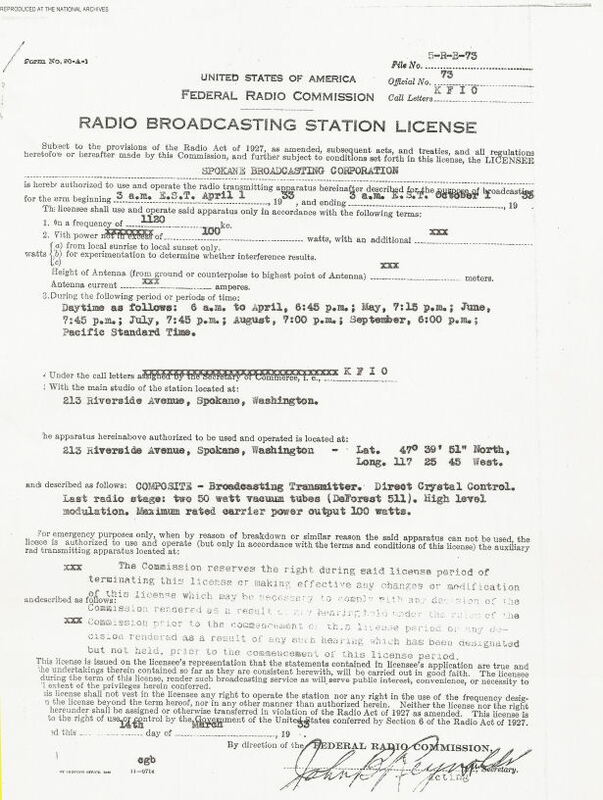 KFIO Radio Station Construction Permit Application 12 June 1930. Federal Radio Commission, Washington, DC, USA. From the National Archives, College Park, Maryland. KFIO Radio Station Licenses 1934-1935. Federal Communications Commission, Washington, DC, USA. From the National Archives, College Park, Maryland. KFIO Radio Station Licenses 1930-1933. Federal Radio Commission, Washington, DC, USA. From the National Archives, College Park, Maryland.